Laser Tag, Roller Skating and Bounce Inflatable birthday parties! Open to the public every day. Just walk in and play in our 4,000 square feet of fogged, Blacklight, pandemonium within a multilevel arena. Individual or team play. Perfect for Birthday parties, corporate events, private events. 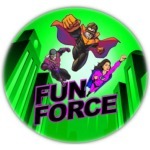 Come visit our new home at Fun Force in Wallington, NJ... just 8 minutes away from our original location. The NY Metro newest high tech roller skating rink, laser tag arena, superb corporate meetings and team building event space.